It’s been said “the clothes make the man.” Well, we wouldn’t go that far, but the clothes may very well make his Adonis Index (Find Yours Here). Or at least enhance it. If you like our systems you probably know that a Man’sAdonis Index, more than his watch or his car is most correlated with making a good first impression. But bad clothing choices can totally sabotage your Adonis Index, whereas good choices can make a guy who’s a 1.4 look like a 1.6! 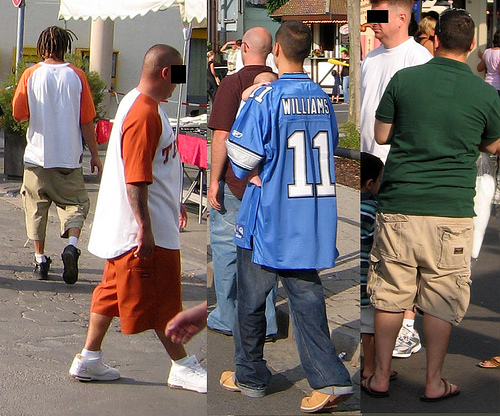 Americans on the Street…Emphasizing their lower bodies, the opposite of the Adonis Effect. Don’t be like them. 1.) YOU ARE NOT AN EXTRA LARGE. As a rule, American sizes are a guideline, unlike European sizes which are numerical and correspond to a certain measurement. Our theory is that American manufacturers want to appeal to guys’ vanity: everyone wants to be an extra large, have a million and drive a sports car. But it just doesn’t work that way, NOR do you have to wear an extra large to show off your Adonis Index. As an example, John, who is 6’1″ 185 lbs and a perfect Adonis Index, often wears mediums, as does Pilon. Considering that the average N. American and European male is 5’10” like Pilon, if you’re buying large, you’re probably making a mistake. In fact, if you DO buy a large or extra large, there’s often going to be a lot of extra material around the waist, so you’re hurting your natural and trained-for V shape. Also, the length will be longer, shortening your legs and overall height, or the extra material may give the impression of extra girth, while form-fitting clothes (like we recommend) tend to give an extra impression of slimness. And if you’re like a lot of guys on our programs, you’ll find you lose some upper body circumference along with waist circumference (don’t worry about this, as you actually look bigger when you have a slim waist than when you were fat), so you’ll commonly to want to drop a size in the shoulders in order to maintain a slim fit and not look baggy. Hollywood Actor Ryan Gosling on the Street. 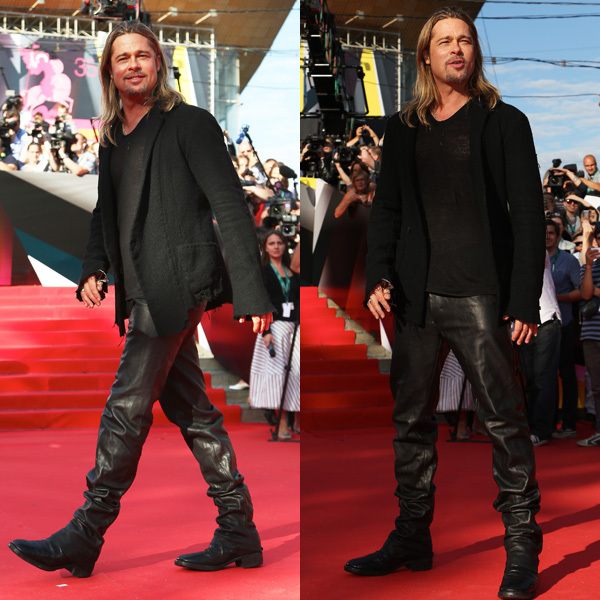 Notice how slim pants lengthen the body and emphasize the upper body. 2.) Try Clothes On In Person, Do Not Buy Online Unless You Already Know How that Manufacturer Fits. This will require you to visit stores more, but it will be worth it in time and effort, because you’ll get the right size, as WELL as stay up to date on fashion. A Medium from one manufacturer may fit like a Large from another, and vice versa. Pants and jeans are just as hard: there are a lot of new fits out there like Slim Fit and Lowrise that you may look great in, but you’d never know it until you try them on; OR, you may look HORRIBLE in them! So you need to know before you buy, or else you’er going to be sending them back. Once you know a manufacture’s idiosyncrasies, you can feel free to order online. But be careful when they change the fit or style on you again! So go to the store and try on that manufacturer, style and size before you buy anything. 3.) Buy Slim fit Jeans and Pants. Slim fit jeans aren’t just for hipsters; they can really enhance your Adonis Index by emphasizing your upper body incomparison to your legs. They also lengthen the leg and make you look taller, whereas baggy jeans are just going to make you look fat and emphasize your lower body, and if you adhere to the principles of our program, you know that it’s the upper body that is more correlated with prestige. The best new jeans are called “drop-crotch, slim-fit” and allow a slimmer fit while still leaving room for the other male identifiers, so, keep an eye out for those. 4.) If you Find Something that Fits Really Well, Buy Two. Once you find clothes that Fit close to your body, that item will become your favorite, and you’ll quickly realize that Fit is the most important element in fashion. You’ll also find out how hard it is to find clothes that fit your exact body type! And once they’re faded or frayed, you often won’t be able to find that item anymore, even on the manufacturer’s website, as most change their selection every season or so. So if you can, BUY TWO of your favorite items. This also lets you have a backup if your favorite outfit is dirty, but it may require saving some money elsewhere or finding sales, and we have some tips for that too in another blog post. That’s it for our first installment of tips and we’ll have some more for you in the future. We hope you can put these to use on your next shopping trip and that people start noticing your AI even more! 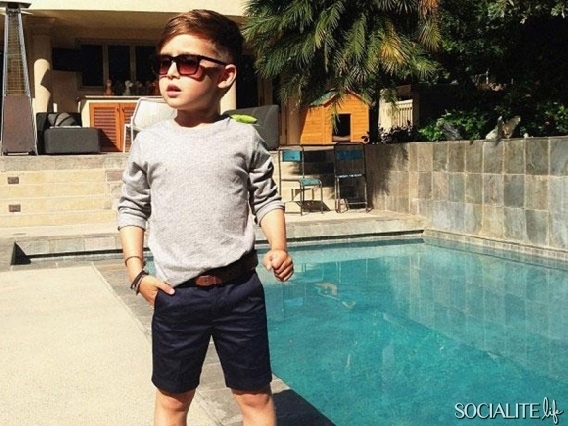 Or When in doubt, just dress like this kid (seriously)!